There's a show on TV here that teaches kids how to cook and is broadcast on Saturday mornings. Cool Kids Cooking presents fun, easy to make recipes that kids can help out in preparing. TK (the host) dishes out the instructions and guides the kids to culinary goodness. And there's a head chef, in the literal sense of the word. The TV Show tackles a recipe per episode, which is then featured on the website. Meals that are fun and easy to make are used, and the kids get involved with both preparation and cooking, cutting with their colorful knives and taking ingredients onto the pan with measuring spoons. The recipes on the website are listed by Episode, and there are two recipes per show. There has been 48 episodes so far as I write this, the last one I saw on TV being rice paper rolls which did not require any cooking at all! There are other fun recipes such as coleslaw, hamburgers, baked goodies, smoothies, pizza, and the occasional salad! 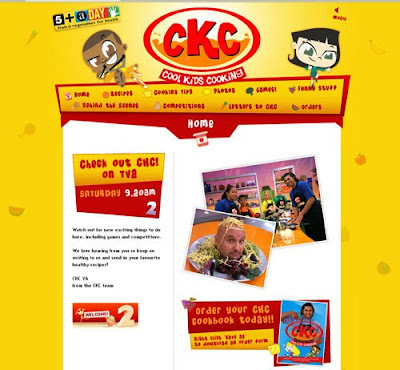 Head on over to Cool Kids Cooking and share the joy of the kitchen with your family.